The 22-year-old has enjoyed a strong season with the Eredivisie giants this term and he has already contributed 10 goals and 10 assists across all competitions. According to The Telegraph, the youngster's glowing form has attracted interest from the likes of Liverpool, Everton, Paris Saint-Germain and the Gunners have now thrown their name into the hat for the player's signature. 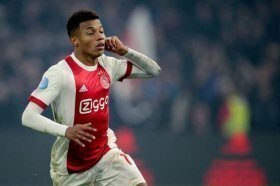 Ajax are likely to demand a fee of around £35m for the attacker's services and reports suggest that the Gunners' pursuit may be dependent on their qualification to the Champions League. Arsenal are currently three points behind the top four of the Premier League but they have the destiny in their own hands with a game in hand and a better goal difference over fourth-placed Chelsea. The Gunners are scheduled to face Watford on the road in the Premier League on Monday night. They will be eyeing only their second away league win since the turn of the year.